Home Blog THE AUGUST BASEMENT BREWHOUSE MONTHLY SPECIAL IS HERE! THE AUGUST BASEMENT BREWHOUSE MONTHLY SPECIAL IS HERE! The firework will hit the Basement Brewhouse on 1 August, but you better try it quick because it’s only here to stay for the month. The Firework consists of a Cape Grim beef pattie, Swiss cheese, iceberg lettuce, tomato, battered jalapeno onion strips and tabasco chipotle aioli. The Firework is served on a French-inspired Bamboo Charcoal Bun sourced from Victoria. The Bamboo Charcoal Bun is unique to the Basement Brewhouse, and not available anywhere else at Bankstown Sports. Made with activated charcoal to produce a sweet, airy and brioche flavoured bun. The Firework is served with shoestring fries, a Brooklyn pickle and your choice of a pint of Basement Brewhouse beer, all for just $25. Basement Brewhouse staff recommend the Basement Brewhouse Amarillo IPA on tap 9 as a cracking partner for The Firework. This American IPA isn’t West or East coast, but something in between. With a liberal use of Amarillo hops, it will leave you reminiscing of half-time oranges when playing sport on a Saturday morning. Juicy but not hazy, hoppy but not bitter, it won’t give you an orange sticky chin, but it will definitely leave you grinning. 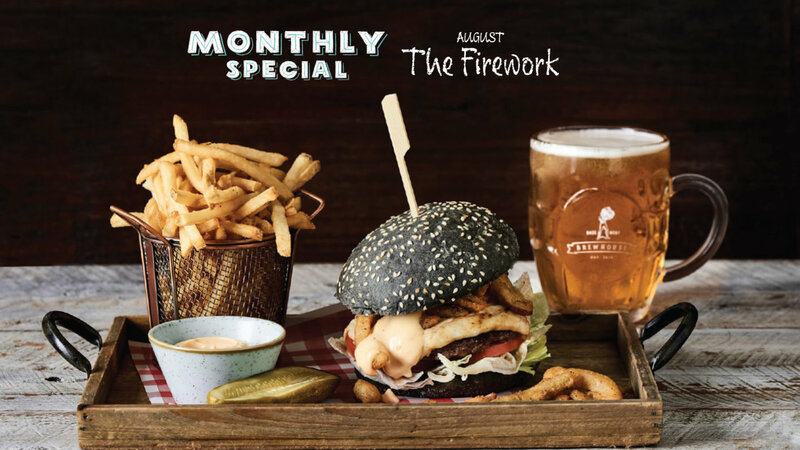 The Firework is only available in the Basement Brewhouse until 31 August 2018.